I've been performing for over five years for a multitude of crowds and I'm very good at what I do. I have to be. I eat, breathe and spin fire. The art form is a very visual one, and my appearance is equally as visual; the performer must look as good as the performance. I will leave the audience sweating. We booked Joseph Kerr for a Halloween performance during a product launch and I have to say it was one of the best events I've ever had. He was punctual, polite, charismatic, and his performance wowed the vendor and attendees. Joseph did a fantastic job even with several curve balls thrown at him. 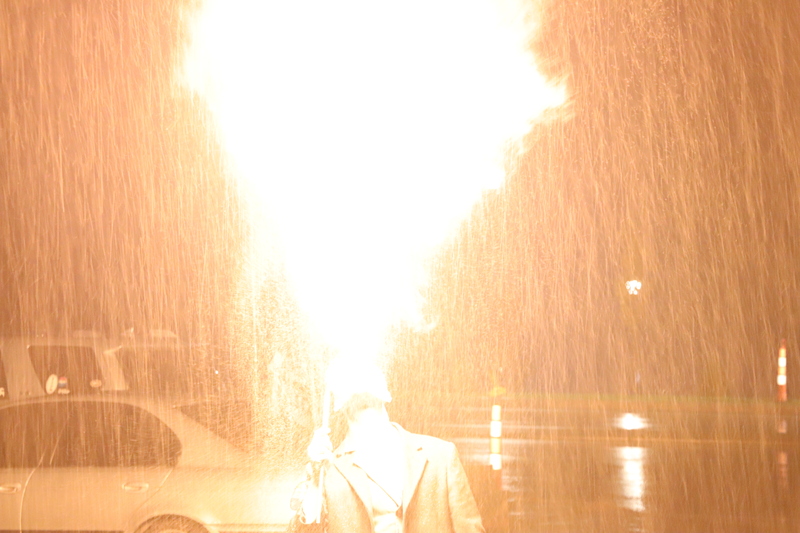 We originally planned for him to do his fire breathing outside but due to rain we thought the event would be ruined. Not only did he find a suitable place indoors for him to do a partial act, he asked what the weather was near the end of his performance and decided to give it a shot outside knowing we had a tent for attendees. He still went outside and stood in the rain for a half hour and gave a phenomenal performance. We highly recommend Joseph and look to find ways to include him in future events! Thank you sir! You guys were so easy to work with, very very accommodating. I hope we can do this again! 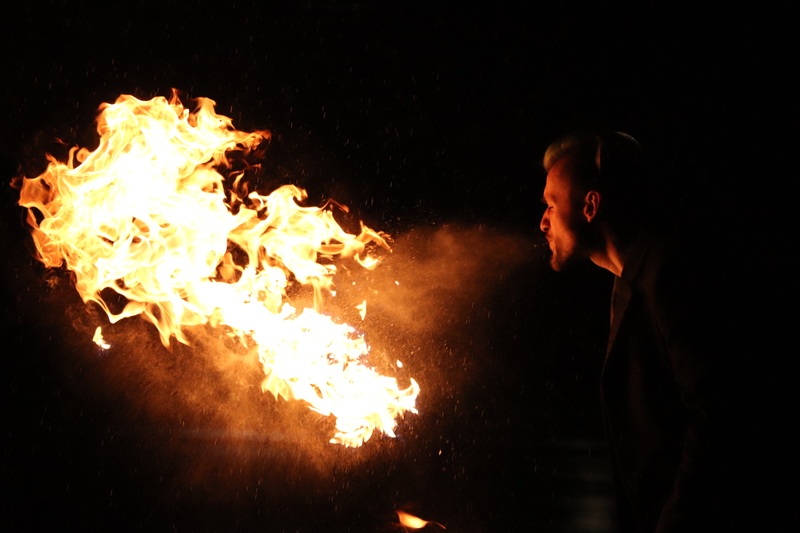 I received a fire eating lesson from Joker, and was amazed by his in-depth understanding of the mechanics of safe fire eating. He explained things very clearly and was so patient with me while I figured it all out. Great guy to work with; very professional and smart!! Joesph was great ! Very professional and fun! 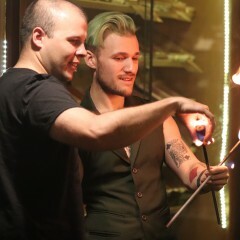 My guest loved the fire show! Aw thank you Shamone! It was a pleasure meeting you happy birthday! Joker is an amazing performer. He was very professional and amazed my guests. I plan on hiring him again! You'll experience a show to fit any audience. 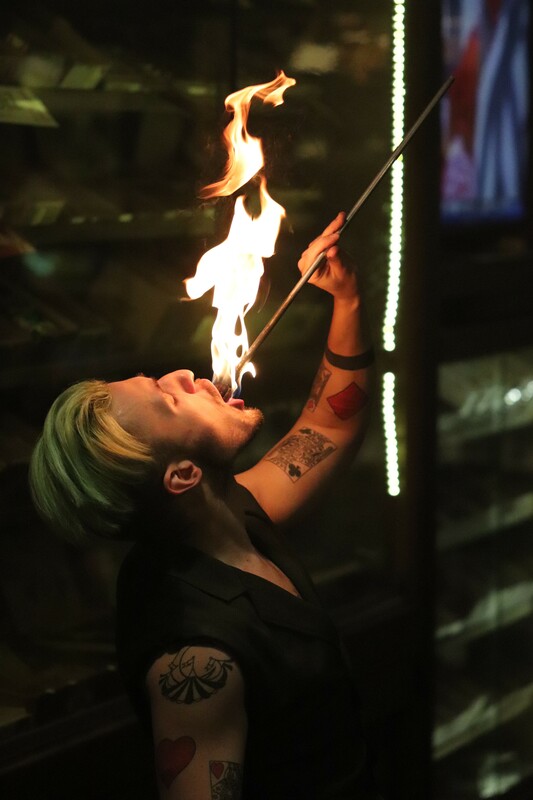 Starting off with some fire eating, I'll display the extremely intricate art of vapor manipulation; ingesting flame one moment only to lightly push it out of my mouth the next. Or perhaps I'll show off my fleshing skills; drawing lines of fuel on my body and then setting them ablaze, adorning myself with fire. Next some fire rope, a type of flow art that ive been working on for some time. I'll set a nine-foot rope ablaze and twirl it in complex patterns and shapes, increasing speed until the flames appear to create physical constructs in the air. 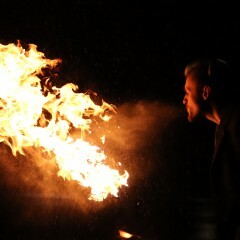 Finally the fire breathing; always a crowd pleaser. 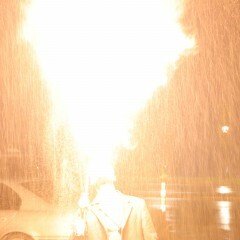 Monstrous plumes of flame erupt from my mouth hot enough for the audience to actually feel. Fire engulfing me as I dance around while painting the air with fire. I've been entertaining folks with fiery joy for over five years. 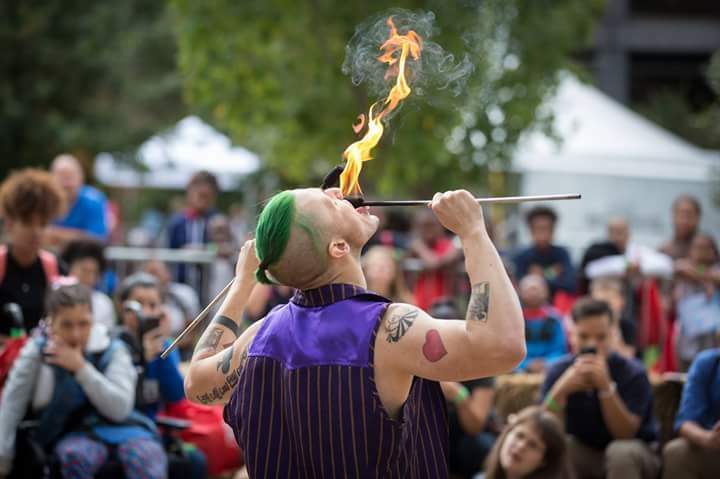 Whether eating, breathing, or spinning flames every audience I've encountered has been mesmerized. 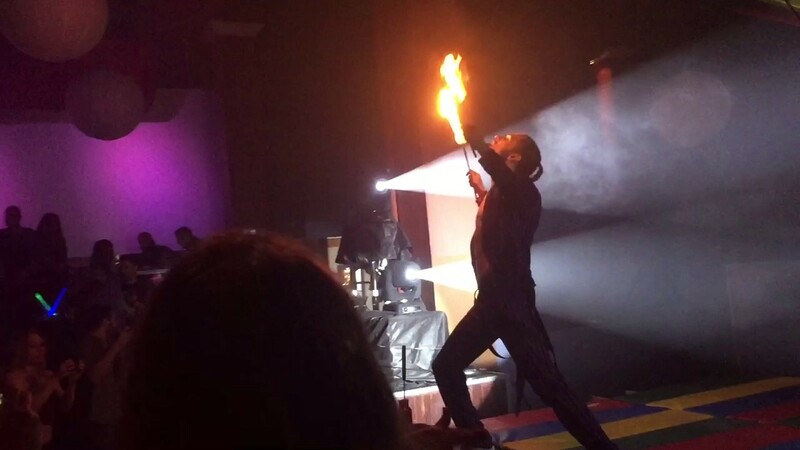 Fire performance is my absolute passion, and I put my all into every show. I have a very interactive style; I love to talk to the crowd and ask for volunteers if it works within the context of the venue. I'm always pumped when I'm on stage, and I'm sure the audience can feel my enthusiasm as well. 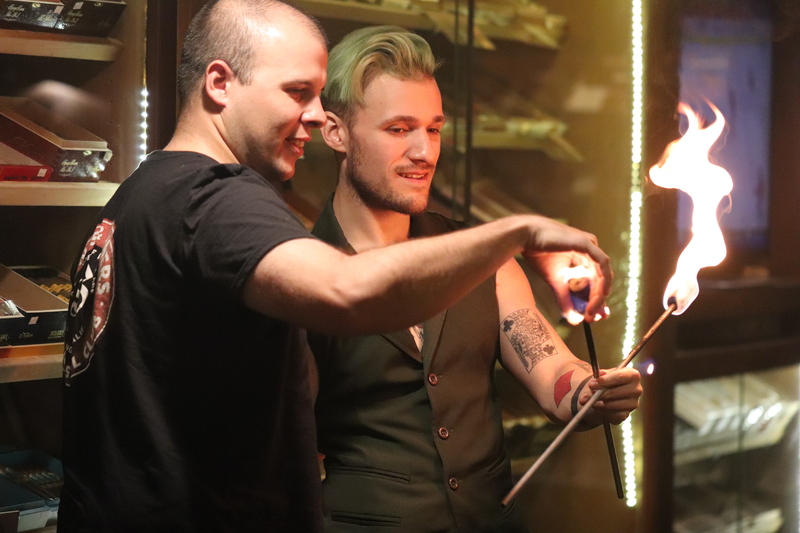 My appearance is as equally as important as my skill with fire, and it is my firm belief that the performer should look as good as the performance. High ceilings are required for indoor performance. I carry my own fire safety kit including extinguisher and fire blanket.